This week's guest article comes from OSWtv's Billy Strachan. This month Billy takes a look at an up and coming Scottish wrestler, by the name of Aspen Faith. Aspen Faith has had a breakout year in wrestling, making débuts in Discovery, Rock N Wrestle, Pride, SWA, W3L and ICW (under the Spacebaws banner). All while continuing to antagonise the fans in the Granite City for WrestleZone. During the Team S.M.A.S.H. era, Faith got to face the likes of "Hacksaw" Jim Duggan (Aberdeen Anarchy 2013) and, current Ring of Honor World and Television Champion, Jay Lethal (Battle of the Nations 2013) but it was his lengthy feud with British World of Sport Legend, and WrestleZone fan favourite, Len Ironside that really put eyes on the self proclaimed "The King of Catch", defeating Ironside two falls to one in a World of Sport Rules match at Aberdeen Anarchy 2014. After defeating Len Ironside, Faith would continue to gloat by carrying a stool to the ring with Len's face on it, cockily standing on the stool as a mark of disrespect. Aspen Faith was hated wherever he went in the North East for WrestleZone, but not content with that, he also travelled to Inverness to superkick Crusher Craib to make a shocking debut for Rock N Wrestle. 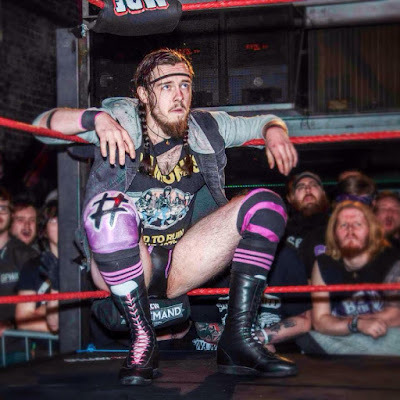 Making his Discovery debut, as Christopher Saynt's hand picked replacement in The Gatecrashers with Dave Conrad, Faith was thrown into the deep end as he faced Wild Lions, Joe Hendry and Lou King Sharp and The Young Bucks on his first night in a tag team elimination fatal four way. Replacing KT Kane with the lovely but at the same time equally devious Sammii Jayne, Aspen Faith is beating opponents one at a time at WrestleZone, marching his way back to title contention. It can only be a matter of time before he holds their Undisputed Title. On a personal note, Aspen Faith is one of my favourite wrestlers. His moveset is similar to the likes of William Regal, a methodical approach to targeting a body part with precision, makes you feel every move as he wretches and twists body parts out of shape. He uses unique moves like a pumphandle flatliner to throw opponents. He can adapt to a brawl while also finding ways to grapple and contort opponents. With his confident swagger, ever expanding moveset and his delivery on microphone, Aspen Faith is the total package in professional wrestling. He is the real deal. But that's just this guy’s opinion. 'Til next time this has been your friendly neighbourhood wrestling blogger. As usual a big thanks to Billy for this article, make sure to go check out all his stuff at the links above. Next week, we'll have the debut article from Lily Lestrange.